Today, one of the most popular devices to listen to music is the ubiquitous iPod. Apple’s iPod not only revolutionized the way many listen to their music, but also how they buy their music and other types of media. While there are plenty of other personal music players, none has had such an impact on culture, the music business and technology. Here is the history of the iPod. In the late 1990’s and early part of the century, digital music players were slowly being created. The industry was new and the technology wasn’t exactly perfected. For instance, while millions of people each year were now discovering the joy of mp3’s on their computers, many realized that carrying around a hard drive of music wasn’t exactly technically feasible. The first mp3 players that were created by company’s such as Rio and Creative were just starting to realize the true potential of a personal digital music player, however storage was an issue. The first mp3 players had storage space of 32 MB and 64 MB, only enough some times to play a handful of songs. In addition, the user interface made the device more like a Sony Walkman and not a next generation digital music player. However, one man did see the true potential of personal digital music players and his name was Tony Fadell. Tony Fadell in 2000 realized that the personal digital music player had incredible potential just waiting to be tapped. While pretty much all the existing mp3 players of the time relied on costly compact flash style storage, Tony Fadell realized that new quarter-sized hard drives which offered 5 GB of storage space could be utilized to offer the consumer an entire library’s worth of music. In addition, with the advent of Napster and its legal woes affecting the entire music industry, Tony Fadell envisioned that his new player could easily link on the internet with a media service where consumers can easily purchase new music that was legally downloaded directly to the player. With this idea in hand he started to meet with electronics and media companies in 2000 to sell it. His first stop was at RealNetworks. At the time, RealNetworks was one of the leaders of online media. They had millions of visitors and a wide range of media products being sold on their site- one of their more notable products was their premium radio and television channels. Unfortunately, at the time, RealNetworks balked at the idea finding it difficult to justify the creation of a separate personal music device when the media they were selling was successful as it is. 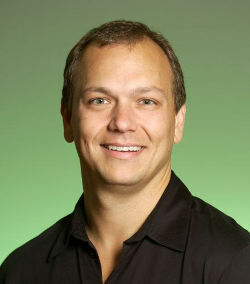 Tony Fadell also pitched his new idea to other company including Phillips, but ultimately was turned down. In his quest to get his idea realized, Tony Fadell went to Apple. At the time, Apple was focused on their iMac line of computers. While they did make consumer electronics in the past (remember Newton), success was not guaranteed. However, Apple was very excited about Tony Fadell’s idea regarding a personal digital music player, especially since only a few months ago, Apple invested and bought a company called Soundjam MP which could deliver digital tunes directly to a computer or music player. Apple gave Tony Fadell the green light to start on his project in early 2001. Apple also gave him a development team of about 30 people and a deadline of one year to create the player. It should be noted that while Apple gave Tony Fadell a green light on the project, he still didn’t have confidence in Apple that they would want to create and develop a player from scratch, so instead he decided to look around for companies that already developed a player and work off their creation. He found a company called PortalPlayer. This company had already developed a player, but it was not yet released to the market. In fact, PortalPlayer had developed over the years several players, but all of them lacked Fadell’s vision- they had poor features and the battery life was horrendous, lasting at most 3 hours. It should be noted that Steve Jobs did take an interest to the iPod from the very beginning and he was present at many of the meetings throughout the year during development. He also tested the product and would express his likes and dislikes about the interface, etc. In about 8 month’s time, Fadell and PortalPlayer put together the working hardware of the new iPod. On the other end, Apple developed the interface and the scroll wheel that would become infamous. The product was ready to be launched in October of 2001. The original iPod was release for sale on October 23, 2001. The First generation iPod included a 5 GB Toshiba hard drive, ARM processors, an operating system from Pixo, a lithium polymer battery for added battery life, a high resolution display and of course the scroll wheel- however the first generation scroll wheel was mechanical. While many in the industry didn’t at first notice the importance of this player, the scroll wheel, large storage and extremely intuitive interface made it very easy to hold a library of music and find songs that you would like to play. Compared to other players at the time that included large storage, the Apple iPod was much easier to navigate giving it an edge. At the time, no one realized just how important the iPod would be to Apple, the music industry and consumers around the world. In fact, when it was first released, many commented on the negatives of the device. It was expensive at $400, the scroll wheel seemed foreign and iPod was not compatible with Microsoft PC’s. However, in a few months time, sales were very brisk and the iPod was rolled out to an excited market in Europe. Later on in the first generation, a more robust 10 GB Toshiba hard drive was available as well. The second generation iPod saw a couple of major changes, but nothing revolutionary to the already successful first generation iPod. First off, the storage capacity doubled and was now available in both 10 GB and 20 GB models. In addition, Apple taking note of who was purchasing their players, were utilizing special software to make their iPod compatible with Windows. Apple now included PIM software making iPod’s compatible with Window’s through MusicMatch. Apple had a business agreement with Music Match to offer legal downloads of music for iPod owners. The second generation iPod definitely was a solid product and was extremely successful for the time period, however with newer iPods on the horizon, Apple and the music industry would realize just how iconic the iPod would become. The third generation iPod was a complete redesign of the product. It helped propel sales of the iPod into the stratosphere. Earlier iPods utilized mechanical parts, however the 3G iPod was completely solid state. All the controls and the scroll wheel were now solid state. In addition the casing was slimmer. The original iPods were bulkier. With Apple realizing the many PC users buying iPods, it added a new dock connector that was compatible with USB 2.0 and Firewire. Other additions included beefed up storage including: 10 GB, 15 GB, 20 GB and 40 GB. And with the redesign came also a new battery, Sony’s lithium-ion battery. While Apple did have an agreement with MusicMatch to offer downloadable digital music to iPod owners during the first formative years, Apple and Tony Fadell always envisioned creating and running their own store to make available legal downloads of music to iPod consumers. This became a reality in June 2003. While originally it started only for those running the OSX platform, a few months later, iTunes was compatible with Windows users as well. iTunes was a cosmic shift for iPod owners. Now they can easily shop and directly download legal digital music onto their iPod music player. With millions of songs available, purchasing a wide range of music from major labels was now a reality and its success grabbed the attention of the music industry, computer industry and media industries all over the world. 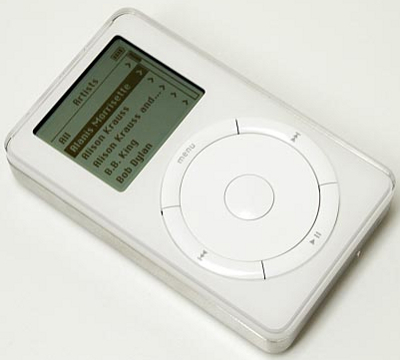 With the success of the iPod in full swing, the fourth generation iPod was released in July 2004. It added additional features and revamped the styling with a slimmer case. 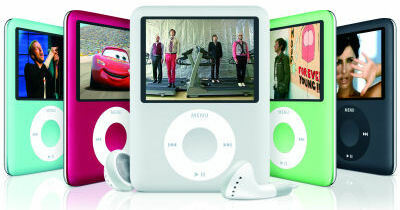 Some of the new features available on the fourth generation iPod included a new color screen, the ability to view photos and additional storage capacity including 60 GB and 80 GB models. There were also some minor changes to the hold switch. It should also be noted that new iPod products were released most importantly the iPod Mini. Later Classic iPods including the 5th generation and 6th generation mainly stayed the same with some minor changes in hardware and firmware. While the casing was much slimmer than previous models the Classic iPod did increase storage capacity to 120 GB and 160 GB, however 160 GB has been discontinued. Also, features such as the ability to play video were added. It should also be noted that the Classic white iPod which at times was available in black as well was now silver. The iPod Mini was released in 2004 to wide acclaim. The Mini was a smaller version of the Classic iPod and it took advantage of a smaller size hard drive that was developed by Hitachi. The hard drive was about half the size of the Classic’s hard drive. However, the storage capacity was significantly smaller. The first iPod Mini had a storage size of 4 GB, which was perfect for the many that used iPods for working out and other activities where a lighter weight and form was necessary. It included a click wheel and a smaller size screen with pretty much the same interface. It also came in five attractive colors including blue, green, pink, silver and gold. It originally listed for $249. There was a second generation iPod mini which bumped up the storage size to 6 GB, on the 2G iPod mini, the gold color was discontinued. The 2G model also had an extended battery life, going from 8 hours of audio to 18. The iPod Mini was the beginning of the smaller size iPods. Storage was getting not only smaller, but offering higher capacities. This meant that the forms of new digital music players could be much smaller than ever before. Apple seized the opportunity to create a fully functional iPod in an extremely small form. The result was the iPod Nano. The iPod Nano was released in September of 2005 to rave reviews. The iPod Nano was the mid level digital music player that while touted a smaller version form of the Classic iPod had a different kind of memory- flash memory. While Classic iPods had hard drives with all moving parts, the Nano was all solid state. This means that there are no moving parts which make it more reliable, especially if you shake it or drop it. The first generation iPod Nano came in either black or white, had a two inch color screen and had a storage capacity of 1 GB, 2GB and 4 GB. It should be noted that it also had the ability to view photos. The Nano was considerably smaller than the Classic, the weight of the Nano was only 1.5 oz and the measurements of the case were: 3.5 inches, by 1.6 inches by .27 inches thick. Currently there have been 4 generations of the iPod Nano. Released a year later in September of 2006, the 2G Nano came in several colors including silver, blue, green, pink, red and black. It also had larger storage capacities going all the way up to 8 GB. The third generation Nano was redesigned to give it a more bulky look. While still quite small, many found the form lacking. However, additional features were added including the ability to play video and a new interface. Storage topped out at 8 GB. The fourth generation Nano saw a return to it’s original form more or less with some slight changes and some added colors. It also includes some nifty features such as an accelerometer which allows you to shake to shuffle and added storage space going all the way up to 16 GB. Besides the iPod Nano, another product that Apple introduced to compliment its line of personal digital music players was the Shuffle. The Shuffle was released in early 2005. While it is known as the budget model of the Apple line up, it does offer a product for those consumers that are looking for a basic music player in a very small form. The Shuffle utilized flash memory just like the Nano, but it didn’t have all the bells and whistles like the Nano. The first generation Shuffle had no screen and a simple click wheel. It also had a form like many USB drives which allowed it to be directly inserted into a USB port to download music. Storage was small for the Shuffle. The first generation came with either 512 MB or 1 GB of storage capacity. The second generation of the Shuffle was known as the clip. It was released in September of 2006 and it came in a multitude of colors. The clip was even smaller than the original shuffle at half the size. It literally clipped onto your clothing or hid in a pocket, perfect for people with active lifestyles. It also didn’t have a screen, but the interface was easy to use. However, it now required an included dock to connect to a computer. The third generation of the Shuffle which was announced in March of 2009 is the smallest Shuffle to date. This Shuffle utilizes text to speech to alert the wearer which song is playing- since there is no display. The unit is so small that the controls are located on the right ear bud cable. The storage capacity of this device is 4 GB. While not an iPod, the iPhone which has become widely popular included a fully featured player with a large screen, flash memory and a wide variety of bells and whistles. The form of the iPhone was so popular that Apple decided it could also sell an iPod based upon the iPhone. The iPod Touch is this creation. 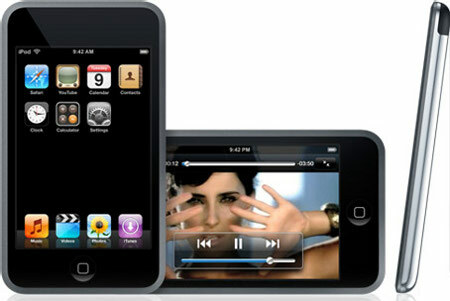 The Touch offers those that like the touch screen of the iPhone as the user interface for this music player. In fact, the Touch looks pretty much identical to the iPhone and while it doesn’t have many of the iPhone features it is less costly and does not require a phone contract. The Touch also offers video playback and wifi including the Safari browser which makes it easy to connect to iTunes and download music directly wirelessly to your Touch. Storage for the Touch comes in either 8 GB, 16 GB or 32 GB flash memory making it solid state. There is a second generation of the iPod Touch, however the styling for the most part has stayed the same (a slight tapering of the back). The 2G Touch offers additional features such as Nike+ functionality, a built in speaker and buttons to control volume. aand data. The Defeder Series may bee the most popular an sports three layers of protection. store like dust, snow and water can harm your gadgets. It is abrasion resistance, and has a slight rubberized texture.